The olive oil runs from the presses at Meshek Achiya like a stream of liquid gold. "But ye O mountains of Yisrael ye shall shoot forth your branches and yield your fruit to My people Yisrael; for they are at hand to come" (Ezekiel 36:8). "We are doing the work that our ancestors did in the time of the Temple, of course with the expectation that the day will come when we will take our olive oil to Jerusalem for use in the Third Temple," said Farm Manager Itamar Weis. "This is holy work that we are doing." In ancient Temple days, there were both animal and grain offerings. The grain offering (often translated as "meal offering") is referred to in the Bible as minhah (מִנְחָה), which means "gift" and is an offering of thanks. This meal offering may only consist of fine flour, olive oil, salt and incense, usually frankincense. 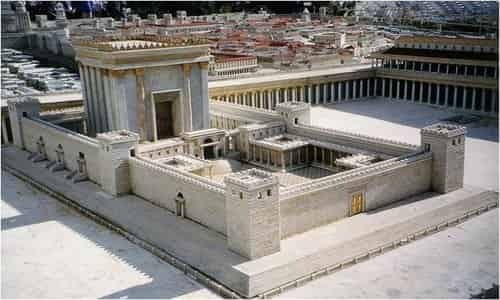 Sacrifices were suspended with the destruction of the Second Holy Temple by the Romans in 70 C.E. The expectation is that they will return when the Temple is rebuilt. Meshek Achiya (Achiya Farm) is preparing for such a time. Located in Israel's Biblical heartland, a team of all-Jewish workers plant and farm nearly 200 acres of olive trees and wine vineyards, all of which are "cultivated with love," according to Meshek Achiya CEO David Zitzer. The farm uses ancient Hebrew agriculture practices with the aim and ideal of building up the Jewish homeland and bringing about the redemption. Meshek Achiya has one of the largest olive presses in the country. The farm's olive oil is of the highest quality and is closely monitored at all stages of the olive-oil making process. "The fruit extract that originates from the 'tree of life' - Proverbs 3:18 - has for thousands of years illuminated holy spaces, and has been used in ceremonies as well as for beauty and culinary purposes," Zitzer said, noting that the farm's oil will be suitable for bringing a personal meal-offering when the Third Holy Temple in Jerusalem is rebuilt. Weis said his staff, all Jewish residents of the area, understand the role they play. They get up early and work in inclement weather, including strong rain, to plant and harvest the olives. Often, the workers accompany the tractors of fruit to the presses and watch as the olives are turned into oil. "It is so meaningful," Weis said. This time of year, the month immediately following Sukkot (the Feast of Tabernacles), is the ideal time to harvest the olives. They are picked from the trees and brought to the presses within an hour to ensure the finest oil. Within the next two months, new olive oil from this season will hit the shelves. Each year, the farm presses some 3,000 tons of olives and sells around 500,000 bottles of olive oil. But Meshek Achiya has not been without challenges. Meshek Achiya was founded 20 years ago by Yossi Shooker, a visionary and idealist who wanted to replant the Biblical heartland as described in the Bible. He purchased a small plot of land and with his own hands he tilled and planted it, said Zitzer. As the time to harvest and press the fruit came closer, Shooker ordered a special olive press from Italy and hired some Italian workers to deliver it and train him in its use. "But at the time the workers came to deliver it, the first Intifada broke out," Zitzer said. "So they dropped off the machine and ran." Shooker was undettered. He harvested the olives and put them in the press. But when he turned it on and started to run it, one of his limbs got stuck in the machine and he was pulled down inside. His wife, who was with him, ran to cut the electricity and stop the machine. Shooker was badly injured. After a few years fighting for his life in the hospital, he died. "The people of the Shomron knew it was their duty to carry on," said Zitzer. So, they kept planting, harvesting and making oil. Over the decades, Arab agricultural terrorists have likewise attacked the farm at least half-a-dozen times, destroying the trees. Last May, Arab vandals demolished two-and-a-half acres of vineyards, costing Meshek Achiya hundreds of thousands of shekels. Zitzer said it takes four years to replant these vines and recoup the loss. But he said his team will keep going. "Every time they tear us down, we replant until our olives and grapes grow, just like in ancient times," Zitzer said. Today, Meshek Achiya has won multiple international competitions and considered among the best and largest olive oil manufacturers in the State of Israel.